Mr. Pradeep Kumar Rawat assumed the charge of Ambassador of India to Indonesia and Timor-Leste on 11 September 2017. 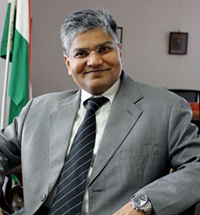 Mr. Rawat joined the Indian Foreign Service in 1990. He opted to learn Mandarin Chinese as his foreign language and served in Hong Kong and Beijing between 1992 and 1997. He returned to Delhi in 1997 and served in East Asia Division for over 3 years. He then served as First Secretary in Indian Mission in Mauritius. During his stint in Indian Embassy, Beijing (China) between 2003 and 2007, he functioned as the Deputy Chief of Mission. Mr. Rawat returned to the Ministry of External Affairs and worked as Director (China) in East Asia Division between 2007 and 2009 and thereafter he was on deputation to South Asian University for 10 months. He then served as Joint Secretary in the Ministry of External Affairs, New Delhi from August 2013 to August 2017. He is married to Ms. Shruti, and they have two daughters.